Over the last year, we’ve been doing a lot of testing with VMware Cloud on AWS (VMC) and it’s pretty slick. 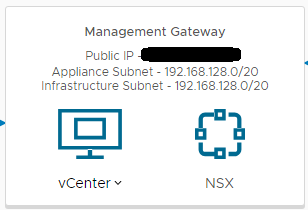 In the past, we’ve used our physical parameter device (Cisco ASA) to handle the VPN traffic, but yesterday I wanted to set up a VPN to the management gateway, and I wanted it done now. Since I don’t have direct access to the ASA, I have to submit a ticket to our NetSec team to have them do it, and they have their own work going on, so naturally I decided to use an NSX Edge for this. 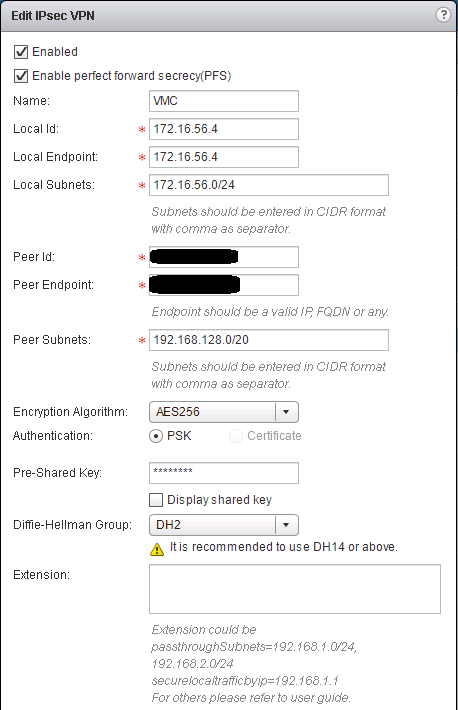 Remote Gateway Public IP: Exactly what it sounds like, this is my public IP that NATs to the private 172.16.56.4 address. I got an error stating the IKEV1 password issue, which I’m sad I didn’t screenshot because I haven’t been able to completely recreate. As it turned out, it was directly related to the Local & Peer IDs. 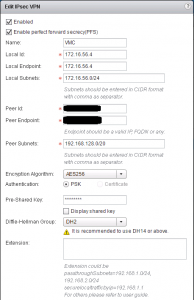 Typically, when setting up an IPSec VPN tunnel between two NSX Edges, you can set your IDs to match. For instance, if I did them between ORD and IAD datacenters, the ORD NSX Edge would have the Local ID of ORD, and Peer ID of IAD; and vice versa for the IAD NSX Edge. Since there were no options for local or peer ID on the VMC Side, I kind of stumbled through it. On a whim, I tried the IPs and it connected flawlessly. And there you have it! That’s all you need to establish your site-to-site IPSec VPN tunnel from your on-prem datacenter to VMC on AWS using NSX!